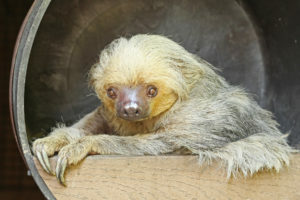 Strictly an arboreal species, two-toed sloths are mainly preyed on by other tree-dwelling animals such as jaguars, ocelots, harpy eagles and anacondas. They live out their 12 years of life in the wild in South and Central America – southern Nicaragua to Brazil and Bolivia. Conservation Status – Due to their large distribution and large population size, two-toed sloths are listed with IUCN as least concern. Two-toed sloths have color vision.